The Twenty-one Taras (Tib. སྒྲོལ་མ་ཉེར་གཅིག, drolma nyerchik, Wyl. 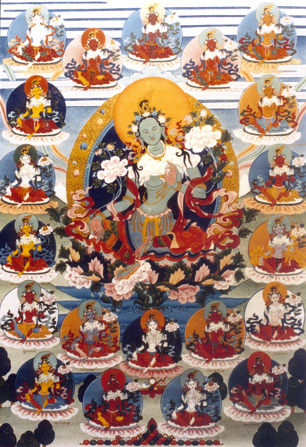 sgrol ma nyer gcig) find their origin in the famous Praise to Tara with Twenty-One Verses of Homage often simply referred to as Praises to the Twenty-One Taras. Suryagupta school, depicting the 21 Taras as differing in all details such as posture, number of heads and hands, colour, implements and hand gestures. Nagarjuna and Atisha’s tradition, in which the 21 Taras are rarely distinguished except by colour, peaceful or wrathful expression, and the colour of the vessel that each holds in the left hand. Nyingma terma tradition of Jigme Lingpa and Chokgyur Dechen Lingpa depicting them as in Nagarjuna and Atisha’s tradition but of different colours and holding individual emblems on top of the lotus in the left hand, rather than vessels. Jikme Lingpa’s and Chokgyur Dechen Lingpa’s tradition differ only slightly from each other. ↑ Stephan Beyer, The Cult of Tara: Magic and Ritual in Tibet, (Berkeley: University of California Press, 1978): 469-470. And: Martin Willson, In Praise of Tara: Songs to the Saviouress, (Somerville: Wisdom Publications, 1996): 118-119. ↑ This list is from yum-ka mkha'-'gro'i nang-sgrub bde-chen snying-po'i gter-bum, based on a translation by Tulku Thondup. Wayman, Alex. Buddhist Insight. Edited by George Elder. Delhi: Motilal Banarsidass Pub, 2002. This page was last edited on 26 June 2018, at 18:26.